I think I’ve warmed up to Ralph Vaughan Williams lately. As 20th century English composers go, he has his own niche. He has the sentimentality of Elgar, but without the aristocratic bluster. He also has some of the folk sensibility of Holst, but less elemental and mercurial. It gives his music a gentle autochthony, like something that blossomed in an English meadow one spring morning. It plays at something very deep within me. In particular “The Lark Ascending” fills me with such a bittersweet homesickness that I can’t help but give it my full, undivided attention. A friend of mine, a classsically-trained organist living in Boston, recently recorded a version of this piece. She knows about my past life in England and understood what a piece of fundamentally English music written on the eve of WWI, during that long summer of 1914, meant to me. I remember a gabled entrance, probably to a church or perhaps to a Catholic hospital. The gable was steeply-pitched, like a typical Gothic building. The inside of the gable (the “tympanum” in Greco-Roman parlance) had a white stone cross that protruded from it about three inches and on this was a wood or metal crucifix. I didn’t see the doorway below it; I must have been on my back. I feel strongly that this was a place I saw in France or in Flanders in 1915 but I can’t place it. The image came to me after reading about casualty movements in WWI from the front to the clearing station to the hospital and in some cases, to hospital ships home to England. 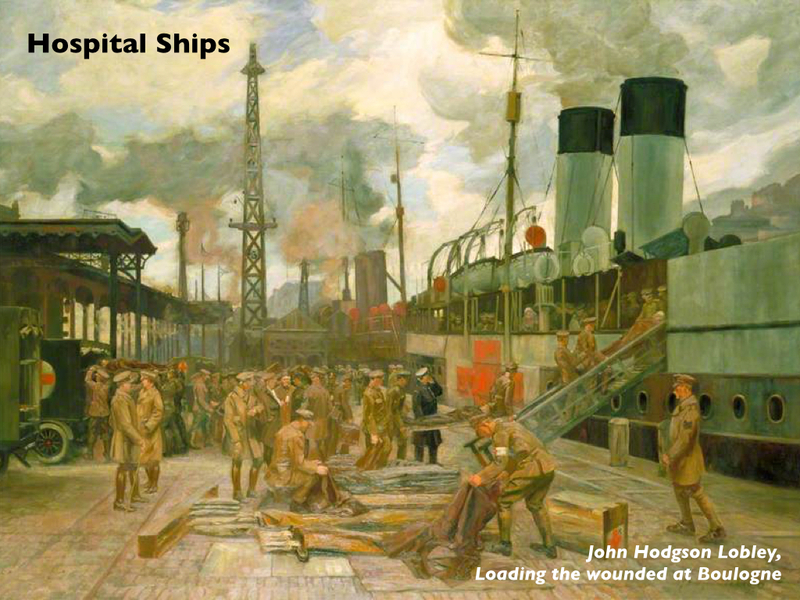 There was a painting with a hospital ship at the docks in Boulogne and it really hit when I saw that painting. I do not have any record on whether or not Jack was wounded at some point but I’ve long suspected he got a “Blighty One” at Ypres at some point and spent at least part of the late spring of 1915 in a hospital in England before being sent back to the front. It was a very common occurrence for soldiers who recovered from their wounds just enough to get back on their feet to be sent back. Perhaps the hospital was a Catholic one that had been commandeered? Perhaps this building with the crucifix was at one of the ports like Le Havre or Boulogne, where we waited for ships back to England? The Helyar Arms, one of the oldest pubs in the Yeovil area (and a landmark in East Coker) has closed, according to the Western Gazette. This time it might be for good; there’s talk of turning it into a block of flats. I knew the Yeovil area had fallen on hard times but this is really bad news. There’s been a pub there for hundreds of years! I really wanted to go to this old pub if I can ever make it back to East Coker. Since I was posting from my phone while half-awake, I’m posting this for more details on the likely grave of Jack’s brother, Albert. The image was found via Billiongraves.com. I searched the same cemetery on Findagrave.com and got no results. Billiongraves even had a photo though for copyright reasons I won’t post it. On the right it reads “Also of Dear Dad Albert James Harris, peacefully, 21 Sep. 1975 Aged 96 years. Re-United.” I had misstated his age as 93. There’s something else interesting. Notice the name of the woman he married, Harriett Ann Harris. I remember having a sweetheart named Ann! I’ve even written it down in earlier entries. This begs some interesting questions for sure… Was I Albert? Did he marry Ann when I didn’t come back from the war? Or is the name only a coincidence? I made another attempt to find some information on Jack’s brother, Albert. I don’t know if this record is him or not, since his birth year is given as 1879 (not 1880 as I had thought) but I found a record of an Albert James Harris who died in Yeovil at the ripe old age of 93 in 1975. He was a husband and father and died peacefully, according to his headstone. I feel strange. I knew he wouldn’t be alive after all these years but this sort of clenches it. If this is my Albert, he lived another sixty years without me. How much water can flow under the bridge in sixty years? Did he think he’d see me at the Pearly Gates? Did I fail him somehow by getting myself killed while he still had sixty years to go? I wish I could have told him that I wasn’t completely gone… I know that chance was gone a lifetime ago but I wish I could have said something. Who knows where or if he’s come back? Every generation sees the generation before it as lazy, self-entitled skivers who will ruin the world when it’s their turn to run it. That will probably never change. All the same, one does get sick of hearing it, after so many lifetimes. Those of you who give credit to succeeding generations and hold that it is better to nurture what is good than to criticize what is bad, thank you. Thank you so much. You are the kick-start that matters in the lives of younger people. You are the force that turns the wheel. First, I remembered something that I need to try to confirm: that he had joined the army before I did. He was 3 years younger, and I joined in my early 20s (in 1902). I feel strongly that we served together in India and caroused together in Secunderabad. I really want to try to track this down now, if I can ever afford the subscription fees to the websites that host this information (they’re not expensive at all but my money always seems to go elsewhere these days). Second, I remembered what Albert looked like, and this I REALLY want to confirm because he looked a hell of a lot like Richard. I saw a man who was tall with thick reddish hair. His upper lip sported a push-broom mustache. I saw him in uniform… he looked every bit as dignified as Richard, even in muddy Khakis. They called him “Paddy” because of his hair color; he hated that because he was English through and through, and we were both devoutly Anglican. This could easily be wishful thinking, but I also remember that our mother had strawberry blonde hair (which I also want to confirm). If this is true then the hair color would have been in our genetics. If Albert really did look like Richard then I’d be more inclined to believe that he might have been the same soul. Also, I had some memories related to when and where he was wounded. I believe he was wounded early on at Ypres, around the time we were in the trenches covering Polygon Wood. I remember not knowing if he was alive for some time, perhaps for the rest of my life; he’d been badly wounded about the chest and shoulder and had initially been reported dead if memory serves. This was a common occurrence at the front. At any rate seeing his name on the headstone forms means he did survive the war, and was probably alive around 1925, ten years after he was wounded. I wish I knew how long he lived. Did he die of despair in the 1930s? Did he join the Home Guard in the 1940s? Did he die of old age some time between 1955 and 1975? I just don’t know. I’m going to try to search cemetery records in the UK but I don’t know if I’ll find anything, since trying to find the graves of any of the Harris family has been met with frustration so far. Another memory I had was of the use of flour sacks to shore up a parapet when sand bags were in short supply. The flour sacks I remember were red and white, emptied of their flour (I assume the flour was used unless it was full of beetles and even then it might still have been used) and re-filled with dirt, though they took on the color of the rest of the sand bags after a while. I need to confirm at least whether or not this is plausible. EDIT: I should mention that the trigger for this flood of memories was the music of Arthur Sullivan. I think I may have been a fan in that particular life. I think I’m going to create a playlist of music from that life and share it here.